This is the second of two posts about an IOT Bitcoin vending machine I built while working for NetBurner. Part 1 is more philosophical. I programmed the coin acceptor to emit ten 100 millisecond pulses when it detects a quarter. The trick was to read this without frying the microcontroller – the CH–924 coin acceptor runs at 12 volts and the NetBurner board runs at 3.3. I’ve developed a healthy respect for the laws of physics, so I enlisted the help of NetBurner engineer Dan Ciliske. We figured out that the coin acceptor pulses at 5 volts with a 10k internal resistor, so I added another 20 kilo-ohms of resistance to bring the voltage down to 3.3.
activities. If your hashes are off by even a byte, then everything breaks – and Bitcoin uses three different hashing algorithms, plus its own method of string encoding. I’m not even going to pretend to understand elliptic curve cryptography (let alone SHA–256 or RIPEMD–160), so I’ll walk through the process of generating Bitcoin addresses at a high level. hash everything. Then hash it again. A mini private key is an array of 30 characters – an S followed by 29 random choices from a list of 58 “readable” characters. To check if a key is valid, you stick a ? on the end and take the SHA–256 hash. If the hash begins with 0, then the original 30-character array is a valid mini private key. The only way to find one is by brute force: you keep generating candidates, adding that ?, and calling SHA–256 on the result until you find a hash that begins with 0. The full private key is – you guessed it – the SHA–256 hash of the mini private key. consists of prepending a version byte to the array – 0x80 for addresses on the main Bitcoin network – and then encoding the result with Bitcoin’s Base58Check algorithm. Base58Check converts binary data to human-readable strings that consist of the same 58 characters used in mini private keys, with the addition of a 4-byte checksum. of the hash to the end of the private key plus the version byte, and encode the result in base–58. I used the b58enc function from libbase58 for that part. Bitcoin depends heavily on SHA–256. Fortunately, I was able to use a NetBurner implementation that worked out of the box. For the next two algorithms, I was on my own. It turns out that libsecp256k1 can use up to 9 kilobytes of stack space, so I spawn a new task with an expanded stack size for key generation. I had anticipated. Bitcoin addresses aren’t like bank accounts from which you can withdraw money; instead, the input to every transaction is a previous transaction. To send bitcoins from my “address,” I would create a transaction that has as its input the transaction that I used to purchase bitcoins in the first place. address, then the $49.75 left over is collected as a “mining fee” by the member of the Bitcoin network responsible for working the transaction into a block. Mining and the Bitcoin blockchain are outside the scope of this article, but take a look at this helpful post. are helpful abstractions – behind the scenes, funds are drawn from a growing collection of addresses that are assembled together in complex transactions. device I lost six hours of a hackathon to the infamous Arduino WIFI shield, and eventually just gave up. Generating QR codes from the Bitcoin keys was easy enough; I just used libqrencode. Printing them on thermal paper was more challenging. libqrencode encodes each pixel with an entire byte – so each byte of a printer bitmap corresponds to 8 bytes of QR code data. and wrote the following code to print them. I used Adafruit’s thermal printer library as a reference. 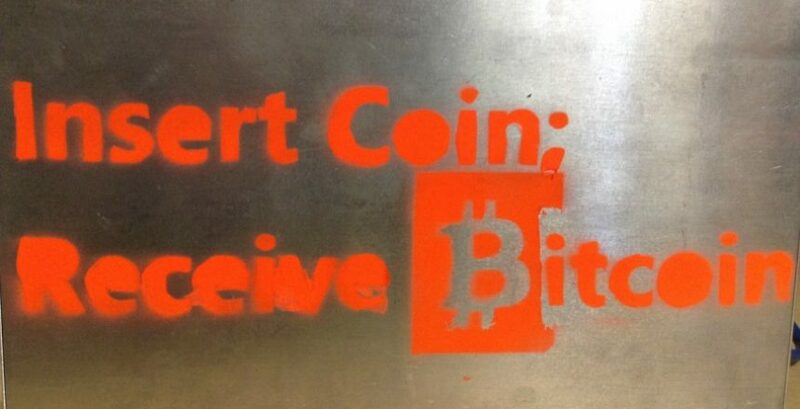 I spraypainted that gorgeous logo on an aluminum case provided by NetBurner cofounder Paul Breed, and then I was done. This was a fun project – an excuse to learn more about Bitcoin and an opportunity to brush up on my embedded C.